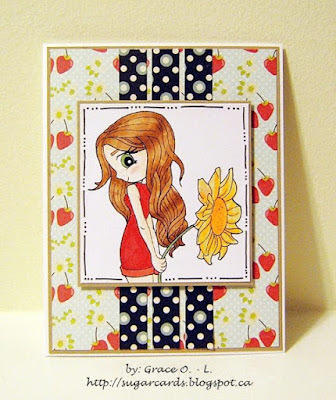 sugar cards: Time For Tea Designs Guest Designer! Time For Tea Designs Guest Designer! BUT my first exciting news is... I've been asked to join by the lovely Lynda, of Positive Force to join her team at Time For Tea Designs as a new Guest Designer!!! WOOHOO!!! So here's the card I wanted to share with you all that I made for Time For Tea Designs as one of their new Guest Designers for the month of August! I created this card featuring one of their newest release ... Sunflower Girl! If you love this image as much as I do, please make sure to stop by Time For Tea Designs blog or store; as well as, their Challenge blog to play, and hopefully you could win 3 images from Time for Tea Designs! YAY!! ALSO for an extra chance to win MORE images from Time for Tea Designs, make sure to enter the TFTD - SUMMERTIME BLOG HOP!!! I am so excited to have you on the team with us!!! I love your use of color and the small details you always add to your projects! This is a beautiful card! Stop by my new blog www.shesacolorqueen.com and say hi and follow me there.